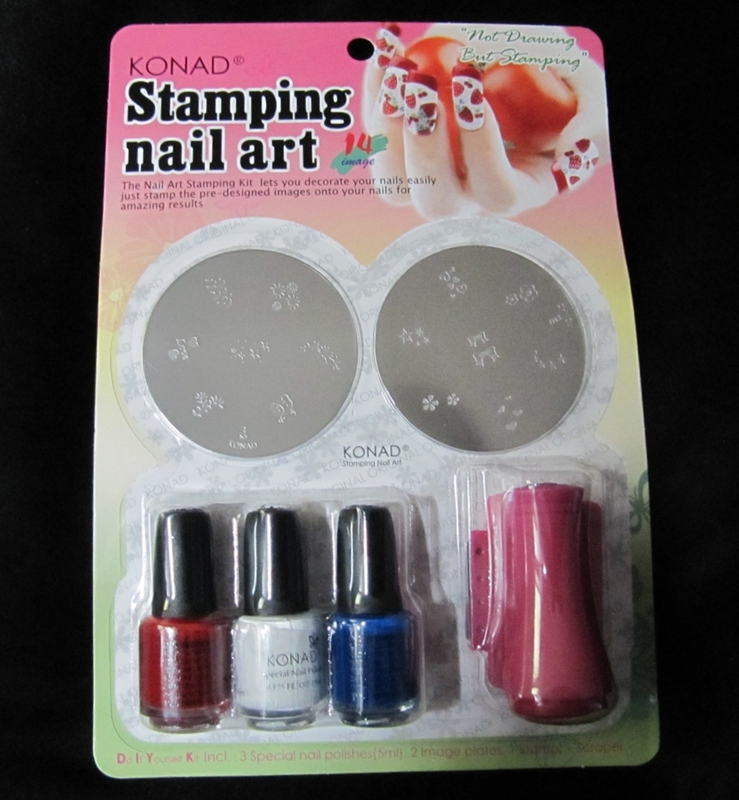 I ordered a starter kit of Konad Stamping Nail Art product a couple of months ago, but hadn’t gotten around to posting about it until now. 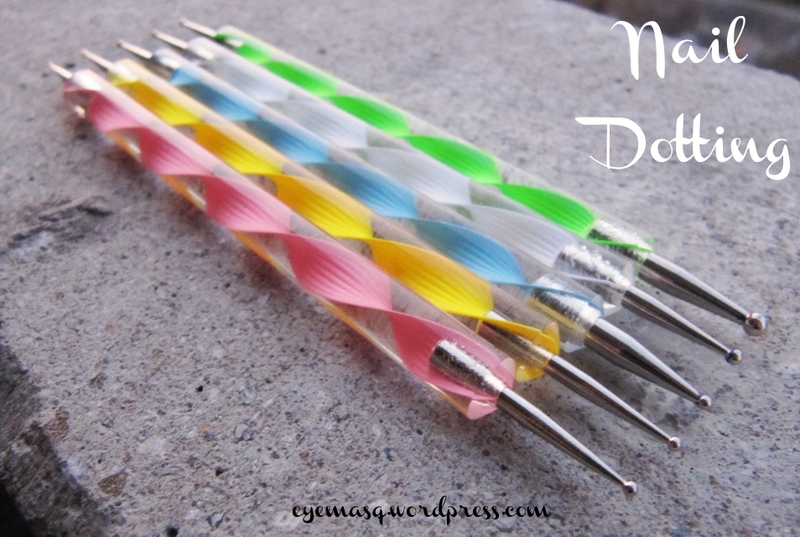 Nail stamping is a very popular trend that you will see all over the internet. You just might not realize that it’s what you are looking at when you see it. 95% of those amazing zebra manicures you see everywhere are actual nail stamps, not stickers and certainly aren’t done by hand. 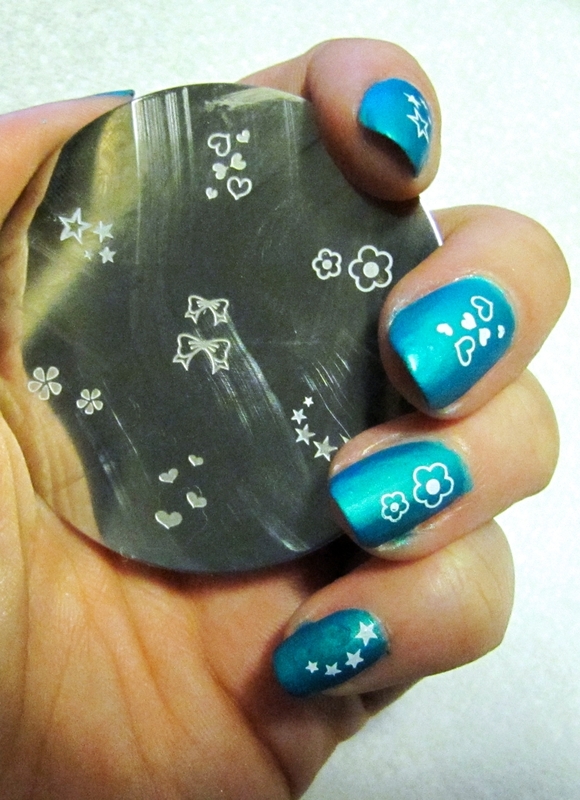 How nail stamping works is you can purchase different plates, with different patterns or designs (even for french tips). You also need the Konad special nail polishes to use on the plates. ***You can’t use regular nail polish on the plates. 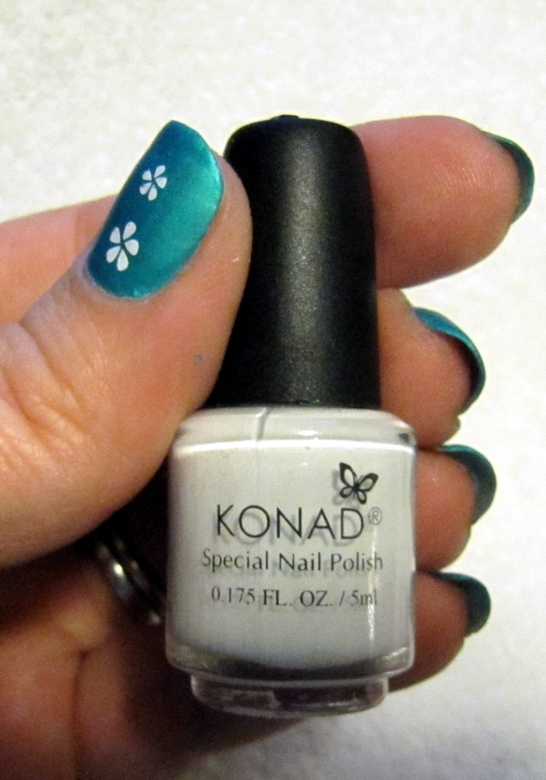 *** You need the “Konad Special Nail Polish”. It has a thicker/sticky consistency and is designed to be picked up by the stamp. 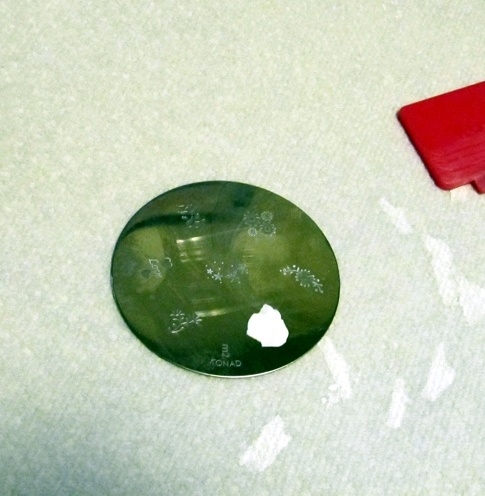 If you try it with standard nail polish, it won’t stick to your stamp at all and will just sit in your plate stencil, trust me, I tried. 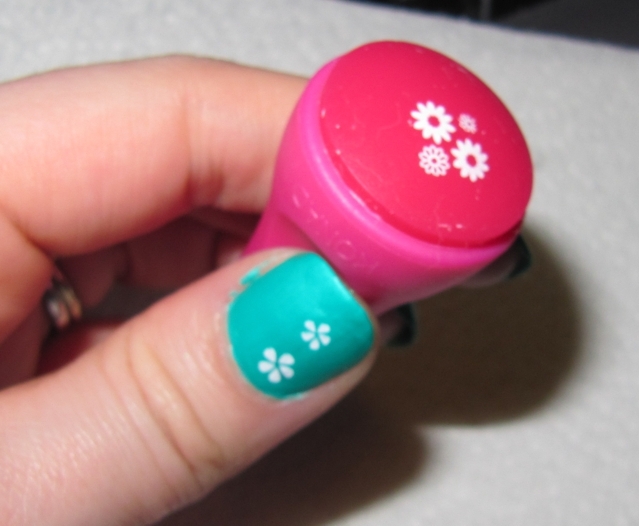 You also need a scraper for removing the excess polish and a stamp for picking up and transferring the design. So I went with the easy solution and bought a starter kit. Unsure if I would like it, this seemed to make the most sense. Nail Polish Canada has a big range of kits you can choose from, ranging from about $25 all the way up to $200. If you are south of the border Konad Nail Art has a website as well that might make more sense for you. Upon comparison between the two sites though, for Canadians Nail Polish Canada proves to be less expensive with their free shipping over $29 offer. Apply Base coat or regular polish to nail. I started out with Turned up Turquoise neon nail polish by China Glaze. Apply Konad Special Nail Polish to desired image within a plate. Take your scraper, angle it about 45 degrees and scrape excessive polish off quickly and strongly. IMMEDIATELY press the stamp with a gently rolling motion to pick up the design. I can’t stress “IMMEDIATELY” enough. If you take your time, the design will end up on your stamp choppy and incomplete. You need to scrape and stamp right away! This caused me some troubles at first and once I sped up this step, the designs started coming out perfectly on the stamp. 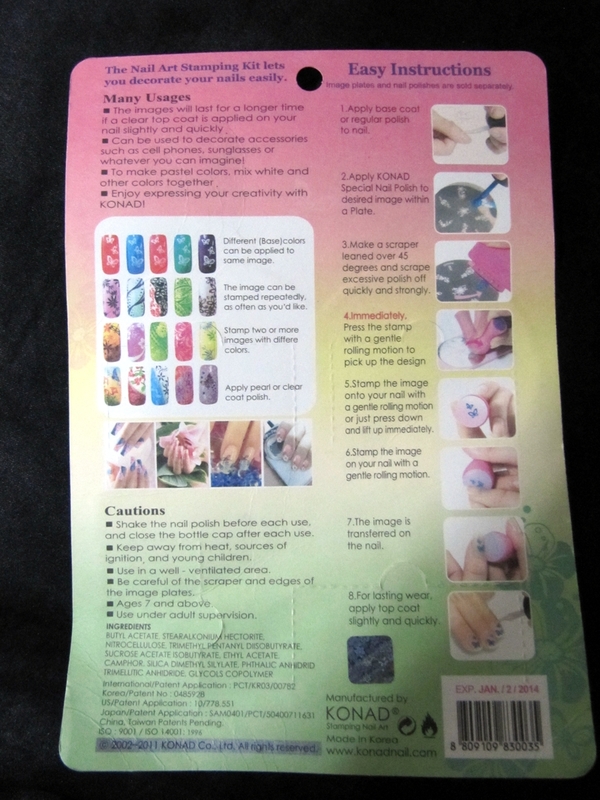 Stamp the image onto your nail with a gentle rolling motion or just press down and lift up immediately. 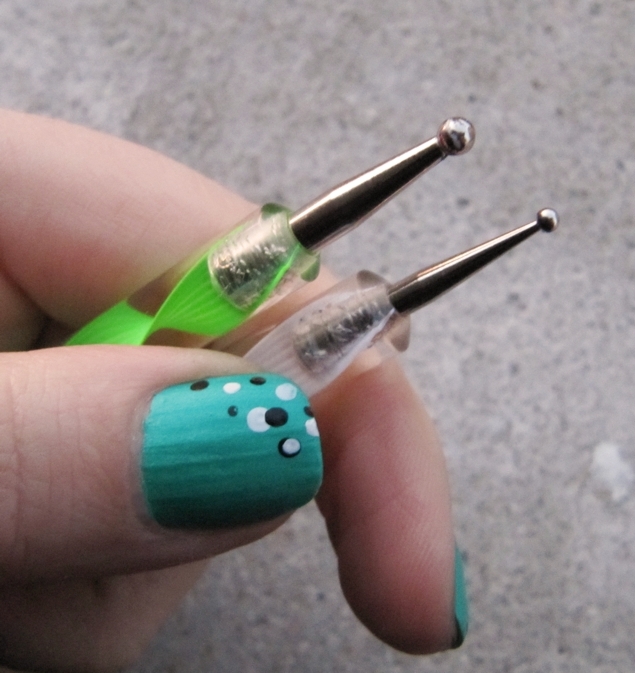 For lasting wear apply a top coat to preserve your nail art. It really ends up being very simple and QUICK. I plan to pick up more plates and polishes in the near future. I want to try the plates that offer both full nail and french tip patterns. Have you guys tried this yet? Do you have a favourite plate you’d recommend for my next purchase?